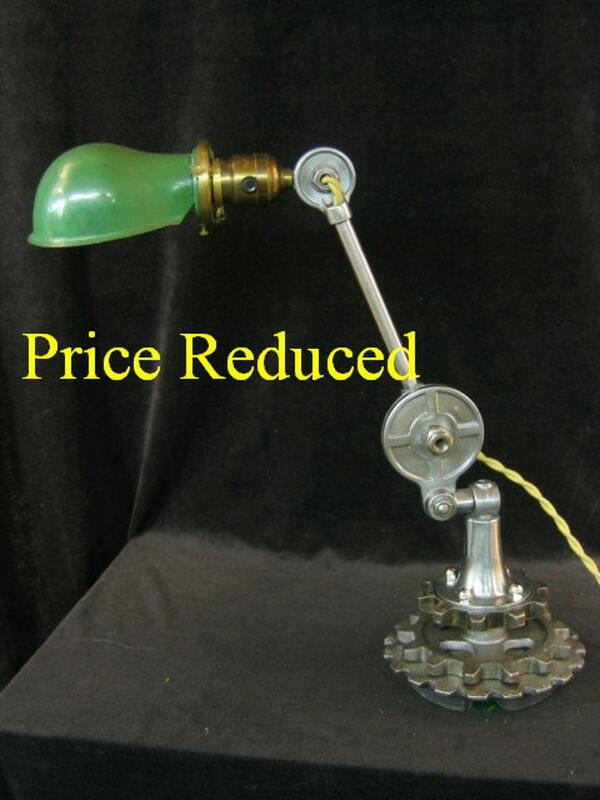 This is my Steampunk Industrial lamp I named Proton. It incorporates a vintage industrial workshop light, a few sprocket gears, a vintage metal shade, and alternate vintage glass shade. I wire wheeled all the parts and lacquered them against rust. This will take just about any bulb up to 75-watts. Please visit our website citylightsantiquelighting. I ship internationally. Typically international shipping costs between $55 and $85. Contact me if you need an exact quote. I only ship on Wednesday and Friday. I do not ship the next day but guarantee to ship within ten days of payment. Really cool creation, lovin everything about it. Well done. Cheers! Exceeded my expectations on many fronts: quality, size, craftsmanship, making me a great package deal and added extras. I also have to say that of the hundreds of online purchases I've made, the care that went into the packaging is nothing like I've ever seen. 2 boxes full of bulbs and breakables made it cross country safely! A wonderful and special piece. This was a gift for my husband and he absolutely loves it. If you are unhappy with the item, you may return it within one week of receipt. Please contact me as soon as possible that an item is being returned. As soon as we receive the item, we will send a refund. Buyer pays the return shipping. Please pack carefully and insure. Massachusetts I use USPS Priority. International shipments I send USPS international priority. I ship on Wednesday and Friday. I try to get things out ASAP but I cannot guarantee shipment any sooner than within ten days of payment. You may request a faster shipping method there will be an additional charge. International Shipments: I ship to Canada, UK, Europe, Asia, and Australia. If I have not, indicated shipping cost in the listing, contact me. Combined shipping: I combine shipping when possible. However, not all multiple purchases can be combined for a discount. I cannot calculate combined shipping in advance of actually packing the shipment. All items can be picked up at a Fun Antiques 2226 Mass Ave Cambridge Ma 02140. You must call ahead 617 547 1490 to arrange local pickup. Items you plan to pick up must be purchased and paid for on Etsy.